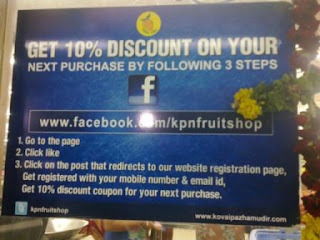 A few days ago when I went to a local fruit and vegetable chain store called as Kovai Pazhamudir Nilayam, it was a pleasant surprise to see a poster wherein they are attempting to leverage social media network as a marketing initiative. As you can see from this picture, it is a simple database building initiative and incentivizes the customer with a discount coupon. It is interesting to see how this regional chain is adapting and innovating to create and maintain a competitive advantage. They have approximately 35 plus shops largely in and around Chennai and Coimbatore and predominantly sell fruits and vegetables. Interestingly this is a category which even the larger chains find to be very challenging to manage. This reminded me of another chain in the pharma space; Pasumai chain of pharmacies. They operate on a franchise model and are again regional with stores largely in Tamil Nadu. They leverage the core concept of Retailing which is aggregation of volumes, thereby creating value. I am not sure if the coincidence that both these chains are from Coimbatore is an important element given that the region is known for being home to a large number of entrepreneurs. The larger message pertains to the fact that Indian Retail chains and also stand-alone shop owners have it in them to keep pace and be competitive while also evolving to keep pace with times. Why can’t this spirit of initiative and competiveness be encouraged and enabled by well thought out policies and assistance? Is it better to assume that these shop owners are an incompetent lot that requires protection from the big ‘bad’ international Retailers or it is more practical and viable to create an enabling environment for these businesses to develop and grow? In that context I wonder what would have happened if our small and medium manufacturers had been enabled and encouraged to compete on a global scale. Would they have given China a run for their money? An interesting debate has been going on about the future of physical things in the face of so many virtual options. What will happen to paper books with the wave of eBooks, especially when one of the leading newspapers abroad recently claimed that their online readership has overtaken the print for the first time in their history. Related to that has been the physical stores Vs Online shopping debate. In my mind it boils down to experience Vs convenience. Will there be a time when customers will completely forgo experience in favour of convenience? Many online shopping fans have been espousing this and they look forward to the same. However, given human nature I somehow don’t think that the appeal of physical experience can ever die down and therefore physical stores will not disappear. The question then arises whether this might happen for a particular category or a particular format? Will any specific space in retail become go completely online and the physical ones disappear? I hope not and recently read an article which validates my view by reporting how online retailers are now seeking physical space by opening brick & mortar stores or at least connect point. Experience might prevail over convenience after all. Click here to join this discussion and also reach the article. 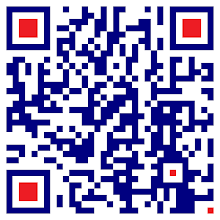 Click here to like my Facebook page.